If Powel Crosley, Jr. isn’t just the cutest robot you’ve ever seen, then you don’t have a heart. Please disregard the "Big Hero 6" robot from this competition because he's the real winner of this competition. But this guy is Disney sidekick material for sure. His cute little anthropomorphic wave would steal the hearts of America if animated. His name is Powel Crosley Jr. and his namesake is the inventor, entrepreneur and genius, Powel Crosley Jr. who you have to thank for car radios, soap operas, refrigerator door shelves, and nighttime baseball (more directly the lights on major league baseball fields). This piece was commissioned by the Cincinnati Art Museum in the early 1980’s and was appropriate as Powel Crosley Jr., the person, not the robot was from Cincinnati. The artist of the piece, Nam June Paik, was fascinated by the relationship between humans and technology and said that, “Our life is half natural and half technological. Half-and-half is good. You cannot deny that high-tech is progress. We need it for jobs. Yet if you make only high-tech, you make war. So we must have a strong human element to keep modesty and natural life.” This is why the sculpture includes a copy of “Treasure Island” by Robert Louis Stevenson, published by person-Crosley on the biceps of the robot. You may think that “Treasure Island” is just some boring crap you were forced to read in 7th grade but it’s about being human, man. You know, things like greed, violence, alcoholism, and adventure! That’s what being human is all about. "Nam June Paik Quotes - Brainyquote". BrainyQuote. Web. 31 Mar. 2017. 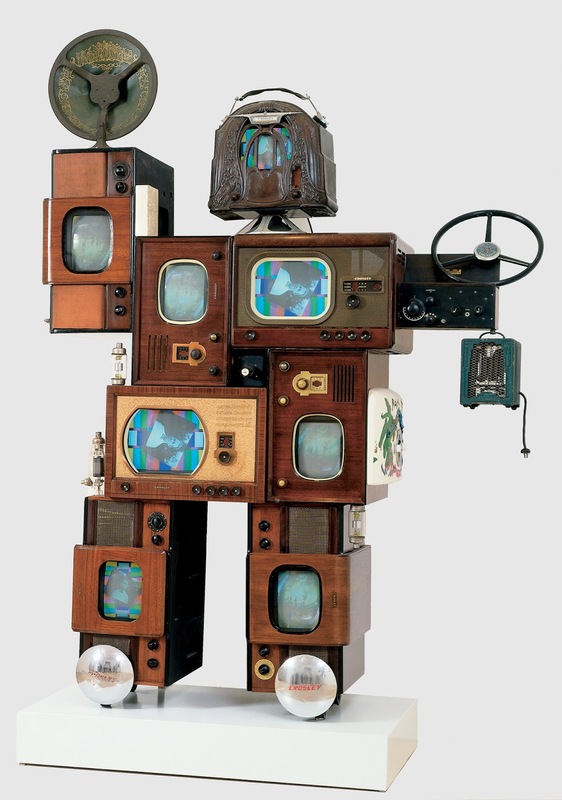 "Powel Crosley Jr., Nam June Paik.". The Free Library. N.p., 2003. Web. 31 Mar. 2017.